Probably one of my favourite places in the world has to be my closest shopping centre, the intu Metrocentre. I know I'm sad but I'm a shopaholic and pursuing the aisles of this huge shopping centre, made famous by BBC 3's Shoplife when I have the energy makes me happy! I'm not huge on window shopping but this weekend I think I'm going to make an exception. 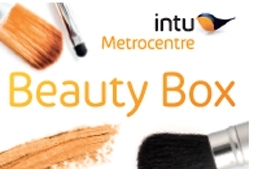 Intu Metrocentre have teamed up with Cosmopolitan magazine to launch their "Beauty Box" campaign, which is designed to help shoppers recreate their favourite beauty looks and effects, and to help them learn more about the autumn / winter hair and beauty trends. Beauty pods will be located in Town Square this Saturday and Sunday, and shoppers will be able to turn up on the day for one-to-one consultations with the Beauty Box style team and centre retailers including House of Fraser, Boots and Marks and Spencer. Shoppers and visitors will also have the opportunity to win products from the participating retailers, as well as an overnight stay at the deluxe De Vere Slaley Hall Hotel in Northumberland. I predict that this is going to be a super busy event, all the makeover slots appear to have gone already :( but there will still be lots to see so I'd get there early if your planning to go. I'm definitely going to try and pop down on Saturday to have a nosey for myself, I just need to padlock my purse first. Will I be seeing any of my North East followers there? let me know in the comments and I'll try and do a post for you if I manage to go x To find out more about the event check out the intu Metrocentre website.